Does anyone else remember that song by the Carpenters? I always find myself singing it when it rains on Mondays even though, like today, I'm usually fairly content to stay inside and knit when we have a day like this. This is my view right at this moment in time. 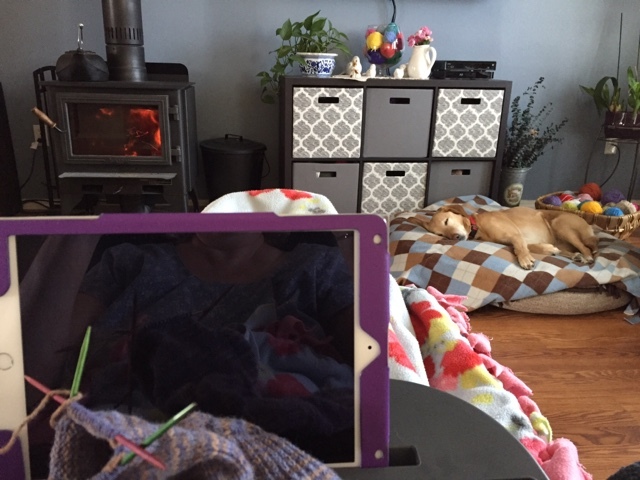 A warm fire because it's chilly outside, Chloe asleep on her bed, covered up with a blanket and my iPad and knitting. What more could a girl want? Lest you think it's all I do, I have washed a few loads of laundry and vacuumed this morning! 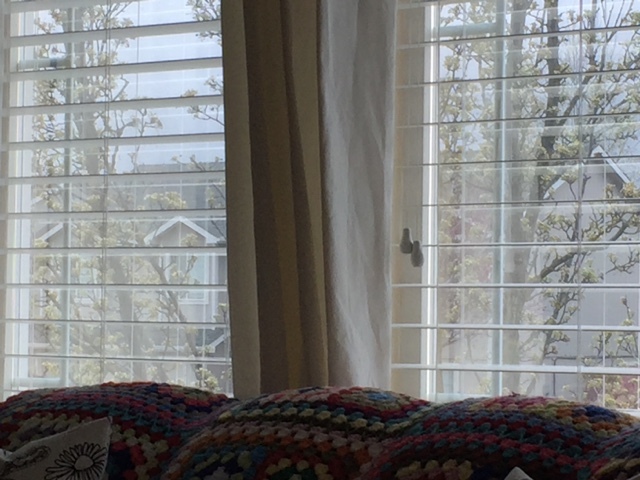 The view out of the window from my chair. The trees have budded out over the weekend, but the wind is blowing pretty hard, I hope those new little buds hang on tight. 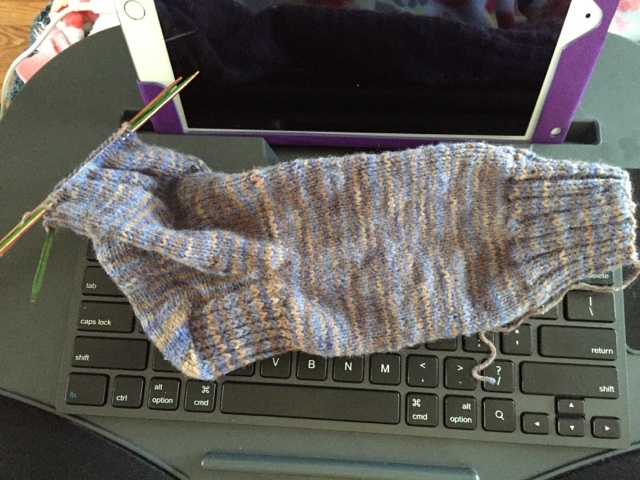 I'm knitting another sock. It was supposed to be for Dennis, but I bought some new sock yarn in my Knit Picks order so Alex will probably get the ones I'm making now. Here's the finished pair from last week modeled by yours truly. 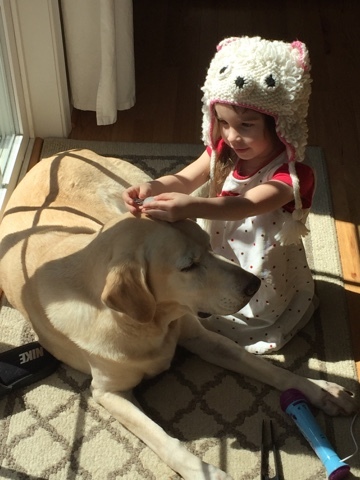 A girl, a hat and her dog. Love this picture of Miss Piper that Mandy sent me yesterday. Piper says she doesn't like it! Polly is the absolute best dog. She will let Piper do anything and adores her little girl. Not much other news. We had a wonderful weekend at the lake with perfect temperatures and sunshine with just a few fluffy clouds. Those clouds were deceiving. I ended up with a sunburned face and neck and I think maybe a slight case of heatstroke. I think I'm more sensitive to the sun now too. Meds again. Bleh. I refuse to give up my lake time though, so I'll have to be even better about sunscreen and staying in the shade. Dennis built me new steps yesterday for the trailer, another step higher so the last step isn't so high. We took them out in the late afternoon yesterday, along with some cushions for the patio set. We finally found some at Home Depot. The cushions were in pretty bad shape after so much use but it's been hard to find replacement cushions that fit. Lori and Nita will be surprised when they see them. That's about it here. Just lake time since I last wrote to you. I hope you all had a lovely weekend and are enjoying spring, (or fall), wherever you may live. It must be wonderful to be spending time at the lake again, sorry to hear about the sunburn, meds can really complicate things. Take care. Lovely to see Miss Piper, she is certainly growing fast. 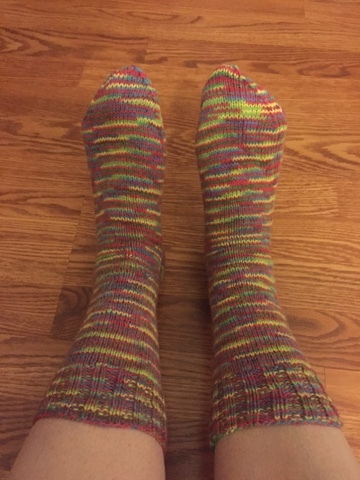 Love love love your sock finish!! So pretty! THe dog and the dear one is a great photo! love your home,it looks cosy!the socks are grandious.I knitt socks at time,too. What a cozy picture of you all wrapped up and the pup sound asleep near you! I love those kinds of days. I spy Betsy in the reflection of your ipad! Love the socks! And I love Piper's hat. Did you make it? I too have to be very careful in the sun. I have vitiligo. My Daddy had it too. I am losing pigment very fast, and this baby pink skin burns like crazy. And it hurts and itches, and is just downright uncomfortable. I use sunscreen and wear hats all the time now. Your Monday looks nice and cozy, Betsy. I hope you enjoyed the rest of the day too. I love those socks, they look very warm. Enjoy your new steps and cushions at the lake! I saw some cushions at Lowe's that I really like but I've never had any cushions outdoors because the climate is just so harsh here. I'm afraid they'd only last a week or two but I'd love to have some. I hope the rest of your week is good. .. I gather you blog on iPad? or perhaps the computer laptop like me? I have an iPad but it is finicky in Blogger. Okay for commenting but not for posting. How cute is Miss Piper in her hat...and glad you are able to go to the lake, and yes! more sunscreen sounds like the order of the day and cover up or in shade out of sun. Cloudy days are the worst for being burnt cos it is so sneaky. Lake time, a cozy fire with a sleeping dog and little Piper cuteness is the very best.